This morning we are again presented with difficult weather. Our plans had originally been to visit Gold Harbor or St. Andrews Bay, two of the most notable and popular locations on South Georgia Island, but these locations are exposed to open ocean wave energy and we are thwarted by rough seas. Ultimately will not see either one this trip, but not for lack of trying. The staff makes the decision to try for Cooper Bay. Conditions are marginal, but because they know how disappointed we are at missing Gold Harbor and St. Andrews, the staff and crew work very hard, coping with large swells at the gangway, to ferry those who wish to go ashore. Some choose not to make the landing, staying onboard for the morning. I know that I will probably not see anything this morning that I have not already seen elsewhere on the island, and there is a good chance it will be too snowy and wet for me to do any meaningful photography. I will not pass up this landing, or any landing on this trip, as the exhiliration of simply being ashore in such a wild and remote place is too good to pass up. I love being on this island, and only wish we had more time here. After a bumpy and very wet zodiac ride, we arrive in a pocket cove protected by rocky outcroppings and covered with cobblestones. Wave energy surges into the cove so timing the landing of the zodiac is important, and we quickly scramble out of the inflatable before the next wave arrives. The shore and slopes of Cooper Bay are covered with snow. It is beautiful. It is snowing, a wet and heavy snow, and it is cold. 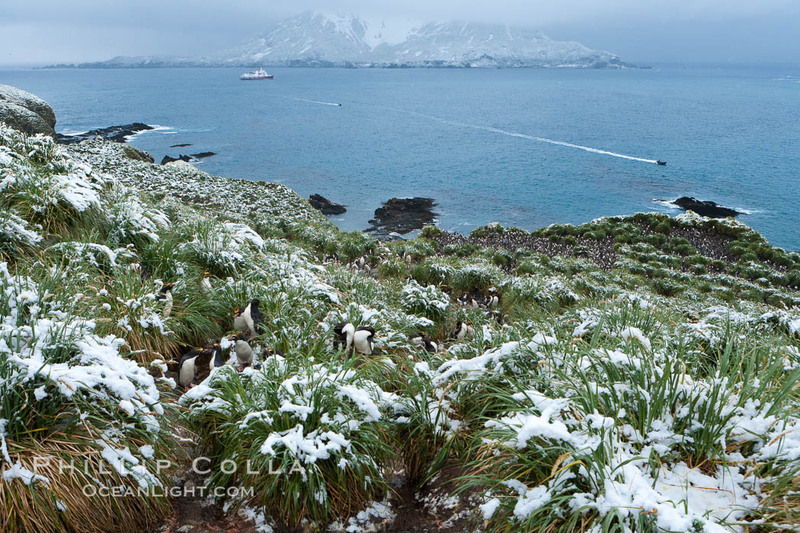 Snow covers tussock grass and macaroni penguins, above Cooper Bay. 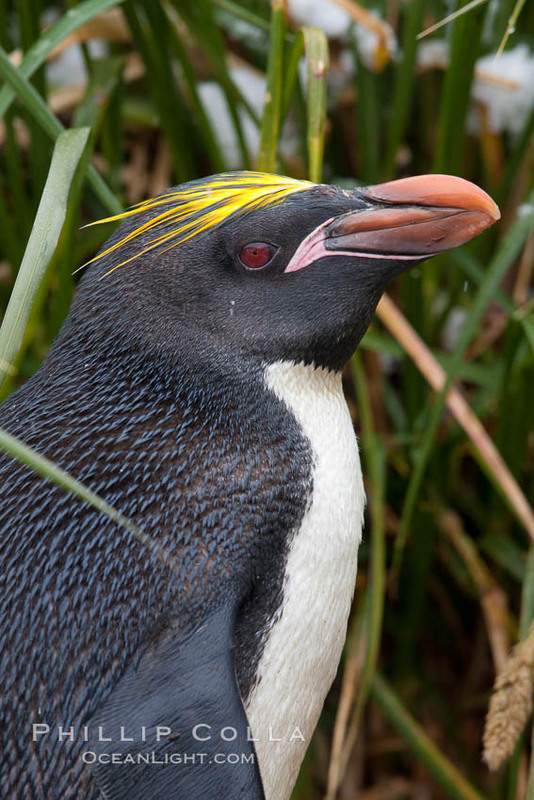 Macaroni penguin, amid tall tussock grass, Cooper Bay, South Georgia Island. We make a short hike to a bluff-top colony of Macaroni Penguins (Eudyptes chrysolophus). The birds are preening and resting, singly or in pairs. They are nestled in — what else? –waist-high tussac grass. I do not see any nests or chicks and suspect they are hidden by the snow and grass. We are on a shoulder of the island, looking down at the colony below. Beyond the penguins and grass is a rocky promontory covered with many more macaroni penguins that overlooks the sea. M/V Polar Star is anchored a ways out, and periodically a zodiac passes between the landing cove and the big boat. The inflatables sure look small in these conditions. This is a short visit since the weather continues to worsen, and I am thankful we came ashore when we did or we may have had no opportunity to visit here at all today. When I return to the beach to return my gear back into my dry bag, I find a fur seal pup lying atop it. The tiny furball, which looks like a sweet little stuffed animal, may grow into a big gnarly bull one day. Once back onboard, the staff decides to leave South Georgia. It is not clear that we will gain any additional time on the Antarctica Peninsula by leaving South Georgia early, but the weather is such that there is no point is staying the remainder of the day. So off we go, heading south for our long-awaited introduction to Antarctica.